2015 The Artist's Magazine "Wildlife Finalist"
We are thrilled that The Artist’s magazine has awarded Camille Engel’s painting their Wildlife Finalist. See the full article in the December 2015 issue. 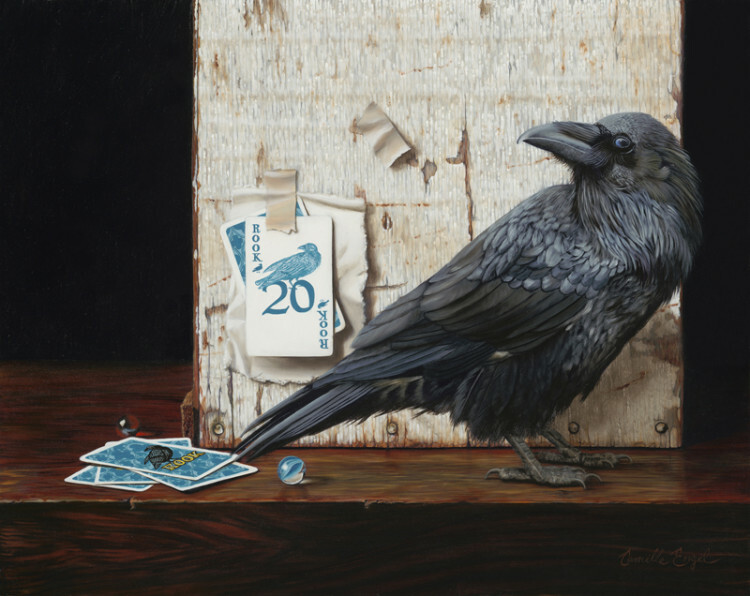 2015 Artists Magazine selects "Strike A Pose" as "Animal/Wildlife Finalist"
Camille Engel's 16 x 20-inch trompe l'oeil oil painting of a raven with Rook cards, “Strike A Pose,” is awarded “Finalist” in the Animal/Wildlife category of The Artist's Magazine 32nd Annual Art Competition. The competitions entries, over 7,500, were particularly strong this year. The editors had a difficult task to whittle the field; it is truly an achievement that “Strike A Pose” was among the ones sent to the jurors. Results published in the December, 2015 issue of the magazine. 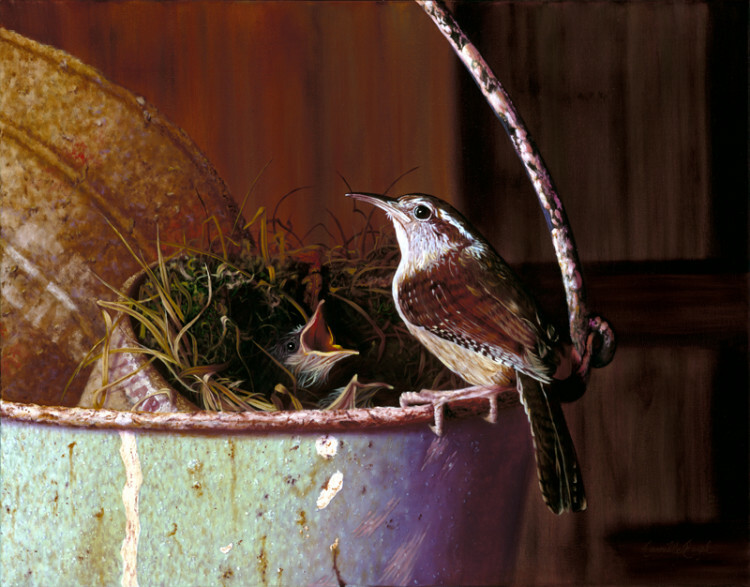 2015 Artists Magazine selects "Home Sweet Home" as "Animal/Wildlife Finalist"
Camille Engel's 22" x 28" oil painting of a Carolina wren with nestlings, "Home Sweet Home," is awarded "Finalist" in the Animal/Wildlife category of The Artist's Magazine 32nd Annual Art Competition. The competitions entries, over 7,500, were particularly strong this year. The editors had a difficult task to whittle the field; it is truly an achievement that "Home Sweet Home" was among the ones sent to the jurors. 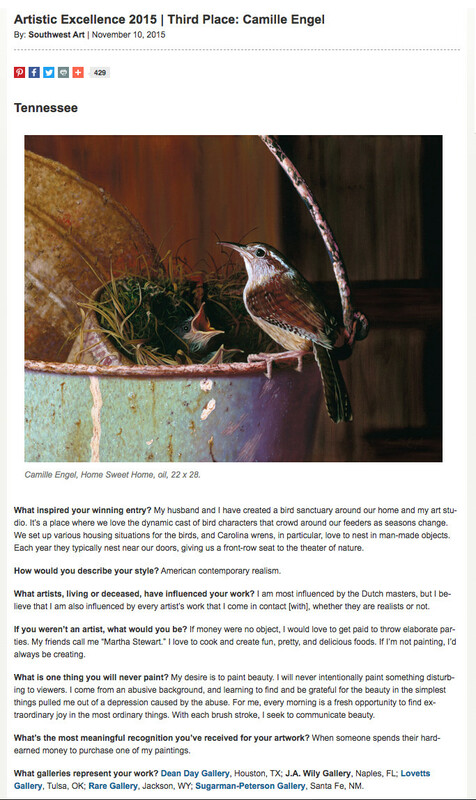 2015 American Art Collector magazine article "Diversity in Painting"
American Art Collector features Camille Engel's award-winning painting, "Rough Around the Edges" in their 2-page article titled "Diversity in Painting." 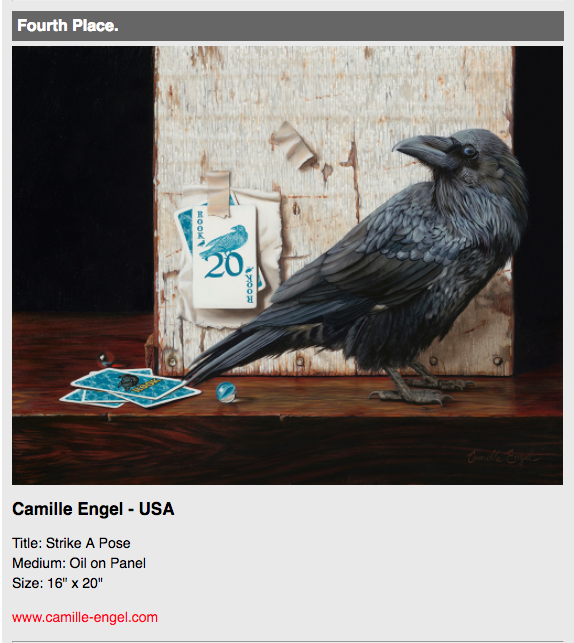 We are thrilled that Art-Competion.net chose Camille Engel's “Strike a Pose” as their 4th Place winner of “Animals, Wild & Domestic”. See the full article in the January 2015 issue. 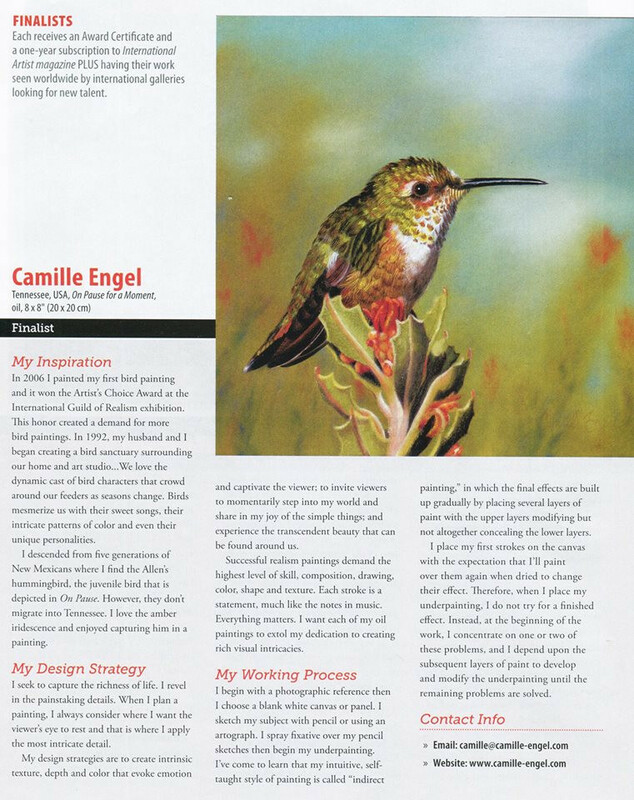 Camille Engel's 8" x 8" oil painting of a juvenile Allen's hummingbird, "On Pause for a Moment," is awarded "Finalist" in the Wildlife category of the International Artist magazine Challenge No. 83. "On Pause for a Monent" is published in International Artist magazine #99, October/November 2014 issue along with a short article about Camille Engel and the creation of this painting. 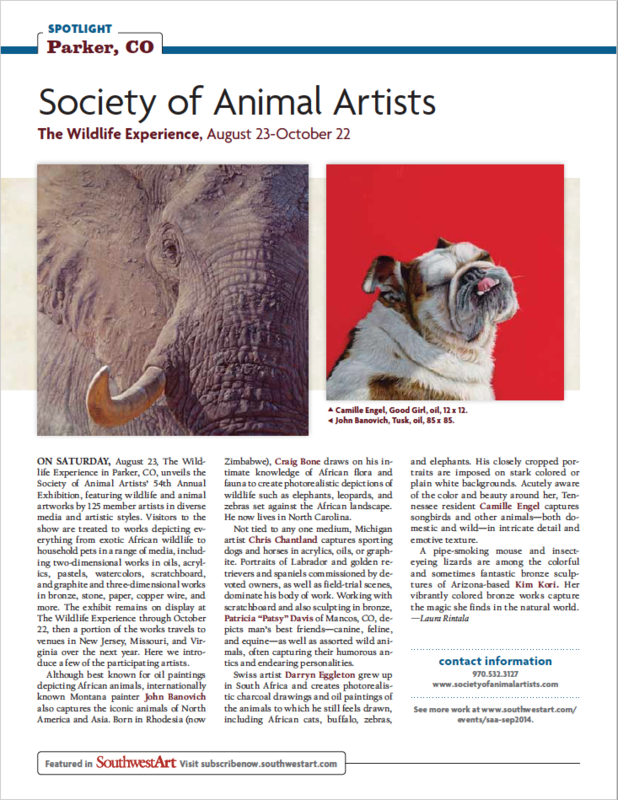 We are thrilled that Southwest Art magazine chose Camille Engel’s oil painting “Who’s a Good Girl” to appear in their “Society of Animal Artists, The Wildlife Experience” article. See the full article in the September 2014 issue. 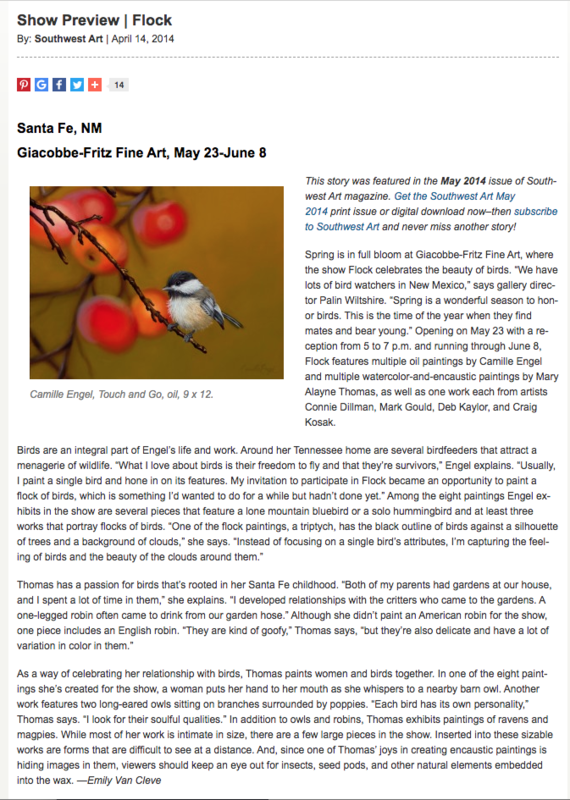 We are thrilled that Nashville Arts magazine chose to feature Camille Engel and her bird paintings in a three-page article. See the full article in the August 2014 issue. 2014 Southwest Art Magazine "Artist To Watch"
We are thrilled that Southwest Art magazine chose Camille Engel as their January 2014 “Artist to Watch.” The full-page article features two of Camille's bird paintings: “On Pause for a Moment” 8 x 8 inches, oil on panel; and, “Smooth Landing” 9 x 12 inches, oil on panel. See the full article in the January 2014 issue. 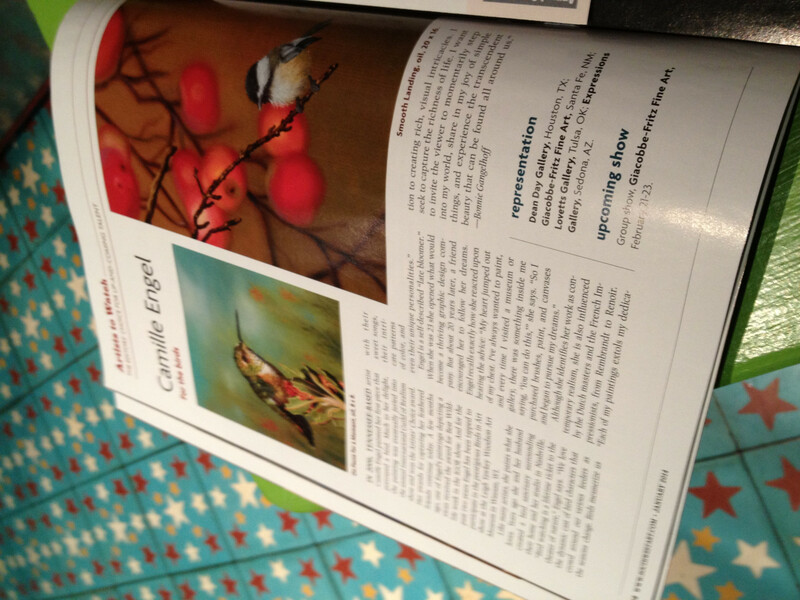 We are thrilled that Southwest Art magazine chose Camille Engel for their article “Flock”. See the full article in the May 2014 issue.